The bell, the only one not in a museum, is estimated to fetch £8,000-10,000. 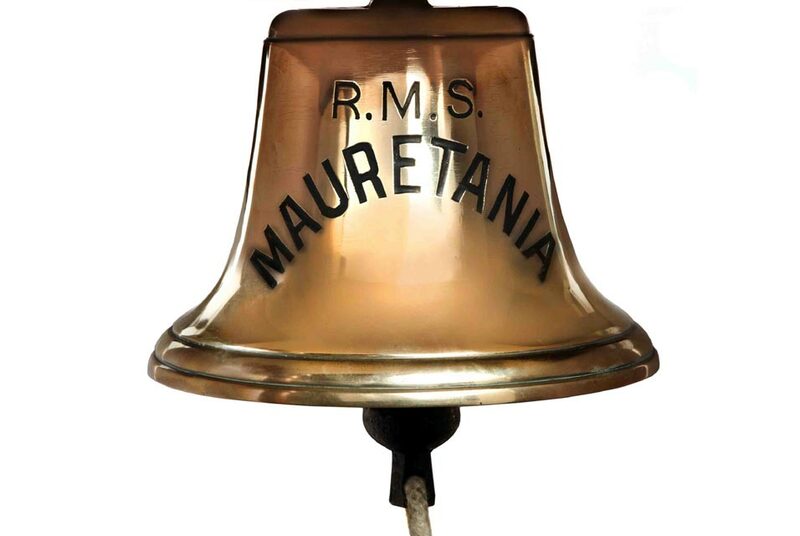 LONDON.- A gleaming brass bell from RMS Mauretania (sister of Lusistania, c.1906), which latterly hung in Cunards offices in the Liver Building in Liverpool will be offered by Charles Miller Ltd on Wednesday, October 26, 2011 in his sale of Maritime & Scientific Models, Instruments & Art in London (25, Blythe Road, W14). The bell, the only one not in a museum, is estimated to fetch £8,000-10,000. Two lamps, also from RMS Mauretania will also be in the auction and are estimated at £1,000-1,500 each. One of the heavier pieces in the sale is a wheel from the engine room of HMS Dreadnought, the Royal Navys first modern Battleship  which revolutionised naval power in 1906. Estimated at £400-600, this is the first time it has been on the market and has come from a private collection in Sweden. A 2-day chronometer, dating from 1916, by Victor Kullberg (Maker to the Admiralty) from another Battleship, HMAS Sydney, which was operated by the Royal Australian Navy is expected to fetch £2000-3000 and was present at her famous duel with Zeppelin L43 in 1917. Also with Australian connections is a Royal Standard (flag) from HMS Renown which was used to transport the Duke and Duchess of York (later King George VI and Queen Elizabeth) in 1927 on their Royal Tour of Australia and New Zealand (Est:£1,000-1,500). A compass from one of the lifeboats of HMT Franconia will also be offered for sale. Completed by Swan Hunter & Wigham Richardson in January 1911, R.M.S. Franconia was a strikingly pretty liner with a pair of handsome raked funnels and a classic straight-stem bow. Initially used by Cunard for their Liverpool-New York & Boston service, she was requisitioned on February 15, 1915 for use as a troop transport. 18 months later on October 4, 1916 she was sunk by U47 200 miles north east of Malta with the loss of 12 lives and 302 saved. The compass was acquired by Albert ("Bert") Walmsley - an air sea rescue pilot who was lost in the Second World War (Est: £400-600). Among the ships models is a Builders half-block model of the Southampton-built Wavertree  one of the last large sailing ships built of wrought iron - which is now on display at South Street Seaport Museum, New York (Est: £2,500-3,500). Among the 19th century pieces is a magnificent Prisoner of War model of the 74-gun ship Guerrier, which has been in the same family in North Wales since it was made, possibly at Beaumaris Castle, 200 years ago is expected to fetch £18,000-25,000. Captured by Nelson at the Battle of the Nile, Guerrier was one of the more elderly acquisitions the Royal Navy took on. A boxed launching gavel and chisel from HMS Sans Pareil, which was involved in the bombardment of Sebastopol in 1854 is estimated at £1,000-1,500. Dating from 1789 - the year of the French revolution is a rare 18th century 16in. noon-day cannon dial with oxidized-brass fittings by Joly of Lille. It is estimated at £12,000-18,000. The sale will also include some fine paintings including Wreck of the Dutton by Thomas Luny and similar to a larger version held in the National Maritime Museum at Greenwich, dating from 1821. The painting depicts the famous story of Admiral Sir Edward Pellew (1757-1833), 1st Viscount Exmouth, who, on the way to dinner, got out of his carriage and helped rescue the crew of the vessel off Plymouth Sound in 1796. Pellew lived in Devon and when Thomas Luny moved to Teignmouth in 1807, he commissioned him to create a series of paintings depicting incidents in his career. The East Indiaman Dutton, 755 tons, was built at Blackwall on the Thames in 1781. The vessel immediately entered service with the East India Company and undertook four voyages to India and China before being wrecked in 1796. It is estimated at £8,000-12,000. Another interesting painting is of the French steamer 'Paris' off the mouth of the Tyne bound for Hamburg by John Scott, dating from 1856, which is also estimated at £12,000-18,000. The iron screw passenger/cargo steamer Paris was built at Newcastle by Mitchell & Co. in 1856 for Schuller & Co. Registered at 413 tons gross (281 net), she measured 181 feet in length with a 24 foot beam and this portrait of her was clearly commissioned by her owners or her first master (Capt. F. Vasse) to mark her completion. Charles Miller Ltds sale will comprise over 250 lots including Scientific and Navigational Instruments and Marine Works of Art. Among these is a single-owner collection of 20 pieces of Scrimshaw, with estimates ranging from £200-£2,000; while a sundial from 1640 by Elias Allen  London-based maker of sundials and scientific instruments for James I and Charles I  which has been later signed by his rival John Seller is expected to fetch £2,000-3,000. Finally, a magnificent and entirely complete drawing set by George Adams of London  described as the godfather of scientific instruments and maker to George III  is expected to fetch £10,000-15,000. The exquisite, complete and hardly-used set dating from 1781 comes with a complete set of watercolour paints by Reeves, with their labels still intact and is in a beautiful mahogany case. Grounds for Sculpture to open "The Meadow" and Steve Tobin's "Aerial Roots"